Natural Deodorant Recipe- How to Make Deodorant | Ultimate Money Blog- Save Money and Live Green! Have you ever wondered how to make deodorant? I have, and decided that I would come up with a recipe that would work better than just putting baking soda on my underarms. I wanted something that felt more like real deodorant. Store bought deodorant contains many ingredients and fragrances. After using my homemade deodorant for so long, I can’t stand the smell of perfumey deodorants. Also, there’s a bunch of controversy about aluminum in deodorant being linked to breast cancer. I like to err on the side of caution. I figure it can’t hurt to use homemade deodorant. Also, your body is meant to sweat to release toxins, so anti-perspirants really aren’t that great. Just use a little deodorant and you’ll be smelling like roses all day! Heat the coconut oil until you can stir in the shea butter or cocoa butter. Once these are incorporated, add in the dry ingredients and the essential oils. I like to use lavender essential oil because it smells so good! You could also use lemon, sweet orange, or patchouli. Use whatever you like! That’s the fun of making your own deodorant. When the mixture cools, you can put your homemade deodorant in an old deodorant container or in a tub and just scoop some out with your fingertips. I reused an old Trader Joe’s deodorant container. You may have to store the deodorant in the fridge in the summer, because the coconut oil may liquefy. Use caution. 😉 Also- I like to put mine on right when I get out of the shower. What kind of deodorant do you use? 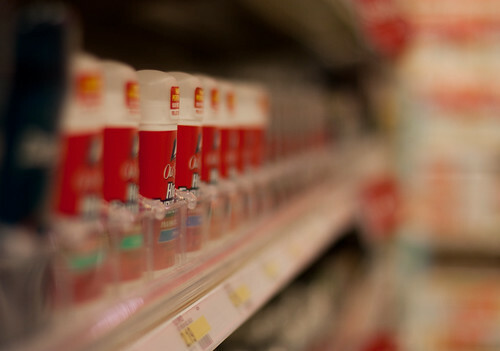 Are you concerned about aluminum in deodorant? RTJM- Sure! That works too! 🙂 I usually do this on weekends. Jersey Mom, that’s what I’ve been doing (I’m a little ashamed to admit it) but I like this recipe too. It’s simple and we have all of the ingredients. I might give it a try. That sounds like a HUGE amount of deodorant! I used to use essential oils as deodorant (like you did with the baking soda). While it did work during the day, it never gave me the oppertunity to remain lazy from time to time, since if I wasn’t showered about 20 hours in after putting it on and the day was hot, I’d go from smelling awesome to reeking. Shery- LOL it makes about two deodorant containers full, so I guess you could cut it in half? I always make some to share with friends/whoever is interested. Let me know if you make it. EOs as deodorant is a great idea too! I LOVE this deodorant recipe! I have been on the lookout for natural deodorants that didn’t cost me a fortune, didn’t contain weird ingredients, didn’t test on animals, etc. – not easy to find! I tried Lush for a while, but the cost is kind of crazy for something I put on my armpits. And the last homemade recipe I tried left me with peeling underarm skin – SO not fun (especially in the warm weather). It’s pretty cool. If you have any problems, you can cut down the amount of baking soda and cornstarch and up the shea butter. If you had problems before, I’d probably recommend that next time. Thanks for letting me know you tried it out! All right, I know this is way later than I should be commenting, but I had to stop in and let you know that the deodorant is still working perfectly – I even went for a 3 mile jog over the weekend, and didn’t smell funky at all! And I’ll give that idea of less baking soda a try next time – thanks! That looks like an interesting recipe–perhaps I will try it once my Tom’s deodorant runs out. Yes, I am concerned about aluminum in deodorant. I understand that it has not been *proven* to be dangerous, but why not err on the side of caution is there are alternatives? Besides, I hate the way those antiperspirants feel on the skin. Laura- It’s pretty neat. And I totally agree with you about the aluminum- why take a chance? TwoBloggers- That’s a great story. I know, once you get into natural living and making your own stuff, it is soooo addicting! I might have to just give that a try. Ever since I learned how to make detergent a few years ago, we have never looked back. Thanks for sharing! Pingback: Is There an LTC Policy Provided by the Health Care Reform Act? I can’t wait to try it. I’ve been looking over recipes for deodorant for some time but haven’t tried. I need a good container to put it in. . .and I haven’t run out of the old stuff. I found coconut oil here in France–duh, I got it at a local shop that sells Tahitian imports . . . But I’m confident that I have a good recipe when it does! But I think I’m allergic to lavender oil :(. So I’m curious to try this out, however, what do you do with moisture? I mean if it’s not an antiperspirant…do you get wet underarms? Isn’t that embarrassing to have a shirt with pit wetness. I’d mostly care in a work environment. I love this idea and have been considering making my own for a while. I currently use a combination of baking soda and cornstarch but it leaves very noticable white marks on my shirts. My question with this recipe is whether you have run into problems with the deodorant staining your clothing, either temporarily or permanently? I use shea butter and coconut oil on my skin and know that it can darken my clothes if it comes in contact with them. We tried this recipe today, and it didn’t harden very fast. I followed what was said, but I couldn’t get it to thicken. Does it harden faster after putting it in the tube? Does it take it a while for it to harden? Does it even harden very much at all?? What about warming up? My turny thing on my deodorant tube broke. Can I warm it up so I can put it in a different container? We live in hot hot west Texas and I think that’s why it wouldn’t settle. We put it in the fridge and it works wonders!! I was working all day and sweating and just smelled of pitchouli, not b.o. (and I’m a man!! ); I’m not sure there was much perspiration at all! Thank you for posting this and for your help! You sure can! I would warm it up and then transfer to another container. I am glad it’s working well for you! What I think is the best part is that you are a man and gave it a try. I love that! love this recipe but i added a little bit of licorice extract (got it from skinactives). i’m on my 2nd week now and my underarm is much lighter now. the baking soda exfoliates the skin while the licorice whitens it. store bought deodorants made my underarm dark. thanks for the recipe. Pingback: Baking Soda Uses | Ultimate Money Blog- Save Money and Live Green! what if i put soda to make a scent for the deodorant? Aluminum powder used in manufactured deodorants has been linked to breast cancer and other medical conditions. Considering breast cancer has been found on both sides of my family, I have to say that I am VERY concerned about using these deodorants. I recently started down the road of sustainable living and have eliminated several store bought products from my life. My husband has joined my little band wagon, too. Since this process began, I have researched numerous concerns (one concern focused on the aluminum powder in deodorants) and have learned that my body is now chalk full of weird, toxic chemicals. The light at the end of the tunnel, though, is that now I am aware of the situation and I am learning how to get rid of those toxins – thanks to websites and information like this one!! They use bees wax and it stiffens the balm so that it does not melt in warm weather. I suggest playing with this in your recipe. I’ ecstatic to find this recipe and my kids and I will be trying it tomorrow! (with the bees wax). I made the original recipie, which I do love. Except that the deodrant melts like crazy because of the coconut oil. So I changed it up and I made half the batch, and used 2 1/2 tspn of shea butter and 1/2 tsp of coconut oil. Everything else remained the same. I love it! It still gets soft but I can still use it out of my old deodrant container w/o putting it in the fridge. I made this today and it came together well–cocoa butter plus peppermint smells just like cookies! But when I put it in a deodorant container (an old Trader Joes one) it all dripped out the bottom and I had to move it to a different container. Any tips? I have been making my own deodorant for about a year now but have been bouncing around recipes not fining one that felt as good as it worked. as a person with very sensitive skin, I have found that the corn starch (which is very processed and actually not very good for you) to be irritating and recently learned that lemongrass EO naturally reduces perspiration. I am about to try this recipe, however reducing the corn starch to 1 tsp, and with lemongrass EO. I think it will be a hit! Let you know how it goes.